Buyer of Structured Settlement Payment | Is Outside Advice a Must? Getting Outside Advice When Selling To a Buyer of Structured Settlement Payment Rights - Is It a Must? Assuming you are planning an agreement with a buyer of structured settlement payment rights, you may or may not already have a pretty good idea of what you are going into considering it to be in your best interest. From the perspective of the government at least, you may not be your own adviser or your own judge or your own boss deciding on the matter. You are obligated, at least by some states, and must be directed according to most states, to seek outside advice on the sensibility and suitability of your payments right transfer to a buyer of such payment rights. The adviser, unaffiliated to the buyer of structured settlement payment rights and disinterested in the factoring transaction, is the one to decide on your behalf whether you know what you are doing and whether you should be advised to do so. The Independent Professional Adviser, or IPA, will render his or her advice and professional opinion to you and perhaps also to the court reviewing your application and the transfer petition of the buyer of structured settlement payment rights. The obligation of a buyer of structured settlement payment rights to advise payees to seek outside professional and independent advice is a key part of the Structured Settlement Protection Acts in most states. The proper execution of this obligation may also be of central importance in judicial decisions on structured settlement payments buy-out petitions. Is IPA rendition mandatory or optional? "advice of an attorney, certified public accountant, actuary, or other licensed professional adviser." 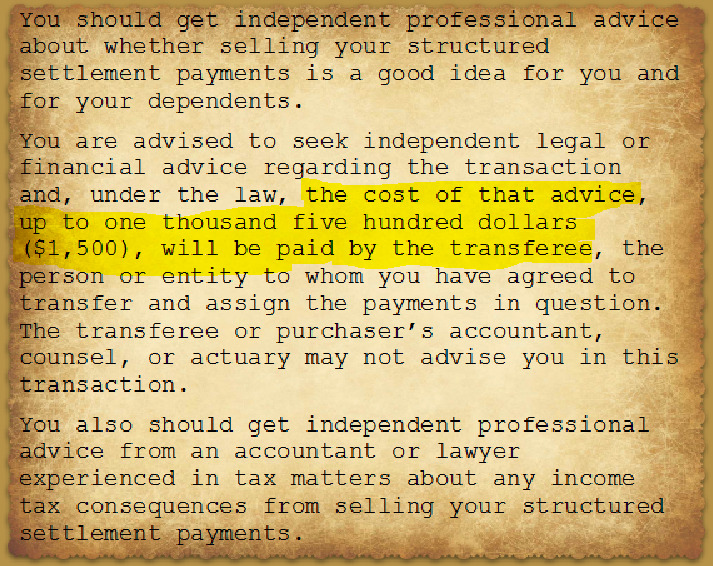 "The payee had been advised in writing by the transferee to seek independent professional advice regarding the transfer and has either received such advice or knowingly waived such advice in writing..."
Similarly, most states allow sellers to waive the right to request outside professional advice. However, some states mandate advice that can't be waived. Still other states, three to be exact, don't require outside advice at all. Does your state require IPA or allow waiving it? Consultation of an IPA used to be mandatory also in the state of Ohio, but in its revised version effective as of March 2018, Ohio's Act requires only written notification to the payee of his right to consult an IPA providing that the seller "has either received that advice or knowingly waived in writing the opportunity to seek and receive that advice." According to Ohio's SSPA, Independent Professional Advice means "the advice of an attorney, a certified public accountant, an actuary, or any other licensed professional adviser." [emphasis added]. What advice should you be given by IPAs? The IPA should ask you questions about your financial status and plans, your sources of income, assets and expenses, your dependents and their welfare and support. The lawyer or financial expert should also ask you about your structured settlement, the amounts and schedules of the payments, the reason why you want to sell payments, and how much you will get in return for selling your payments. Have you considered a student loan, if applicable, a bank loan, or other possible ways to get the money? Did you shop around and obtain quotes from different buyers of structured settlement payments? If you need the money now to pay off debts or fund current needs, are there possibilities to negotiate payment plans, cut down on interests, or reduce debts? They may examine whether the price you are offered for the payments is fair and reasonable. The IPA may also consider whether the sale of your payments is or is not in your best interest, taking into account the reason for selling, your ability to support yourself and your dependents and cover your bills, and your intended use of the money that you are paid in exchange for your transferred payments. The IPA may review the disclosure statements of the factoring company (buyer of structure settlement payment rights) and ensure you understand the process and the terms. Also, the adviser should explain to you possible financial consequences and tax implications from receiving upfront cash from a buyer of structured settlement payment rights in exchange for selling payments. Will the lump sum put you in a higher tax bracket? Will you lose benefits that you currently are entitled to because of earning a large amount of money? Will the money affect your ability to receive financial aid for college? The financial adviser or professional may be consulted by you over the phone and then write up his conclusions and professional opinion. The adviser may offer advise for or against the transfer agreement with a buyer of structured settlement payment rights. Is the IPA a legal or financial adviser, or both? According to the SSPAs, the adviser is to advise on matters of legal, financial and tax concerns. Here is the issue: it is legally forbidden for a person to render legal advice unless being licensed to do so. It follows that a financial adviser or planner or other professional who is not a lawyer is not permitted to offer advise on legal matters. If this is the case, then who is offering the advise on financial issues? Or is it required that a payee consults both a lawyer on the legal matters as well as a financial professional advising on financially related issues? In some cases, judges have requested to see written evidence of financial advice rendition or the content of the advice written by the financial professional to the client. This brings up the following concern: is a lawyer, or financial professional allowed, or may he be required, to disclose discussions and advice given to his client? Isn't this a violation of laws governing relationships between attorneys or advisers and their clients? Who pays for the advice, seller or buyer of structured settlement payment rights? In most states, the IPA can not be referred by, or compensated by the buyer of structured settlement payment rights in return for rendering his or her advise. Thus, the buyer can't be the one paying for the advise service. The IPA will disclose to you his or her charges and payment structure. The SSPA of California (it's actually called there the Structured Settlement Transfer Act) is unique in regard to this and to the previously discussed matter of who pays the adviser in that it mandates that "the cost of that advise, up to one thousand five hundred dollars ($1,500), will be paid by the transferee, the person or entity to whom you have agreed to transfer and assign the payments in question." In other words, contrary to the provisions of other states, California's act doesn't eliminate compensation to the IPA by the transferee. 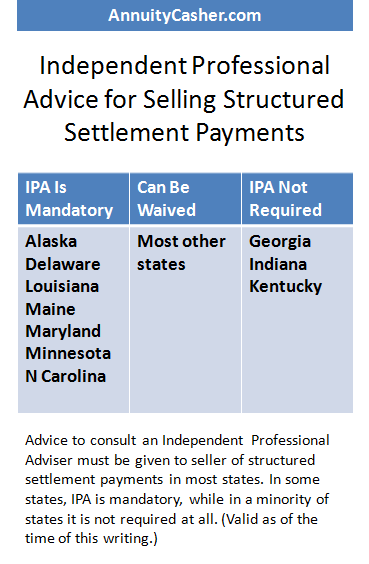 Although the "transferee or purchaser's accountant, counsel, or actuary may not advise you in this transaction," the transferee (buyer of structured settlement payment rights) is the one mandated to pay for the IPA service and is obligated to pay an amount up to $1,500 for the IPA rendition. Compliance with the IPA provision is required just as the rest of the statutes requirement and failure to comply may be ground for denial of the structured settlement transfer petition. In documented cases of structured settlement transfer petitions, judges have denied transfers due to insufficient evidence of IPA rendition or because of failure to meet the "independence" criteria. Looking for a Buyer of Structured Settlement Payment Rights?